Today, I am thinking about grounding. “Grounding,” for those new to the term is the practice of energetically finding our roots, drawing attention to the center of our being, and then being fully aware and engaged in the present. This is useful. Grounding in the present is one reason I practice astrology. I know this could seem contradictory. Isn’t astrology all about predicting the future? Why would it help with being present? Astrology can be helpful for giving us glimpses of the challenges and blessings coming our way, but really, I reach for my ephemeris (a book listing planetary positions) when I want to know what is going on right now, and what might I do to align myself with it so that I can be grounded. Today, I am thinking about grounding because I am thinking about the earth’s intelligence and the need I feel within and around me for a greater intelligence—insight into navigating pain, confusion, conflict, and injustice. Oh, just those small things which seem to be rising up all around, calling for our constant attention. There is a mirroring that happens between the Earth and the stars. The seasons, which translate to signs; the elements, which translate to energy; and human longings (we are beings of the Earth), which translate to planets create a direct exchange between the present conditions we experience on Earth and the sky above. Mars and Mercury are moving retrograde right now. The retrograde journey of a planet brings the external experience inside. Externally, Mercury rules thought, communication, travel, connections. Sometimes those things run smoothly and we get to take them for granted. Sometimes they don’t and we experience a range of emotion—anger to confusion. Things working well, and sometimes not, is always present. How we react and where we react can shift. You may be noticing that frustrations are creating a bigger impact in your internal experiences. Checking in with emotion is a good use of a retrograde period. The Mars piece makes it even more potent. Will, desire, anger, passion—Mars helps us know the impact and function of these emotions. When Mars energy isn’t going well, we may feel apathy or we may feel rage. Somewhere in between, Mars becomes useful for getting the most out of life. This retrograde period is an opportunity to reconnect in a deeper way to passion and desire. The storms of anger and the listlessness of apathy are signs we need to rekindle our fires. Rekindling life force fire has been my focus for this Aries lunar cycle (begun on April 7), which ends this week on May 6. Aries is the fire sign of emergence. At the end of the Pisces season, Aries serves to give the boost to begin a new cycle of life. Seeds of rebirth were planted. What do you notice growing in your life from those seeds? I notice the earth’s intelligence speaking to me about rootedness. I notice that I am eager for the next lunar cycle (Taurus) that begins this week. I long to rise up like a tree from embodied wisdom. I am already crafting my next lunar intention. I want a good grounding. May 2—Balsamic Moon: Surrendering. 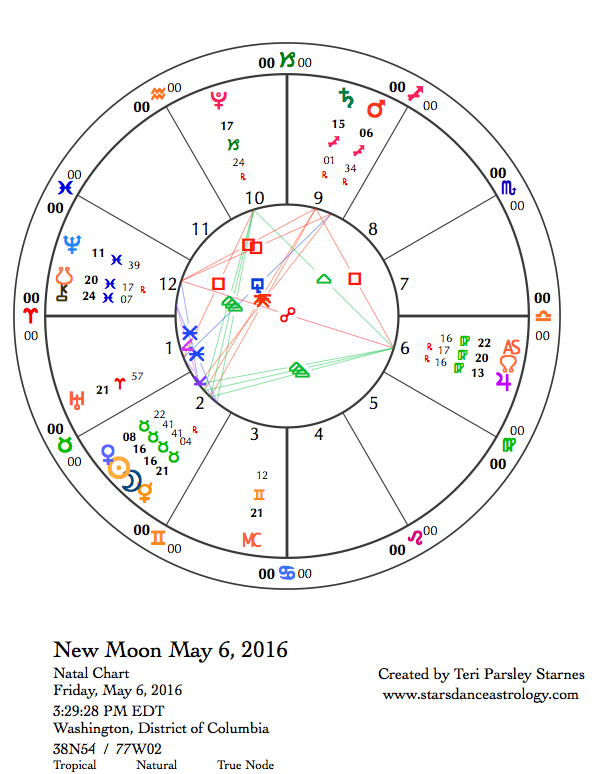 Today’s Moon’s sign resonates with the Moon phase. Pisces is a sign that specializes in surrendering. Perhaps this term is confusing. For me, this phase is about letting go of my ego attachment to outcome. I surrender the intention of the lunar cycle to Mystery as an offering to the practice. Pisces helps us to get in touch with the larger container of our lives. It also helps us get in touch with the ways our human hearts are similar to each other. The desires and needs of the ego become secondary under this awareness. The Moon opposes Jupiter in Virgo and makes a square to Saturn in Sagittarius today. Feelings expand even farther under this contact with Jupiter. Our response to this expansion could be to try and fix things. That is a Virgo impulse. This is OK if we also realize that ego plays no useful role here. Being of service (also Virgo) is a more balanced response to all the heart awareness that awakes today. Saturn plays another role. Saturn asks for accountability and responsibility in our interactions today. Sagittarius helps us align with our values and truth. Are you acting in accord with yours? Tuesday, May 3. A delicious grand earth trine this week helps us to listen better to the earth’s intelligence. The Sun in Taurus (fixed earth) makes a trine to Jupiter in Virgo (mutable earth). Pluto in Capricorn (cardinal earth) is near enough to these degrees that it joins in on the aspect pattern. On Saturday, the Sun will exactly trine Pluto. Next week, Jupiter will station direct, so we are feeling the influence of this station now. That means Jupiter’s influence is strong. The Sun shines a light on that influence. Since August 2015, Jupiter has been transiting through Virgo. Jupiter enters Libra in September. These next few months are the reaping of this transit. Virgo rules health, wellness, service, daily work, apprenticeship, and pragmatic systems and solutions. If you’ve felt a stronger urge to get your health, work, or life in better order, you can thank Jupiter. Don’t take this opportunity to align with earth for granted, a hazard of a grand trine. The Moon in Aries is a contrasting influence creating a sense of impatience if we aren’t mindful of the benefits of slowing down to earth’s pace. Make room for creative passion and then get to work. Gravity plays a role in the connection between the Sun in Taurus and Saturn in Sagittarius today. We may be tempted to gravitate towards theory, belief, dogmatic truths, when the earth is speaking to us of embodiment and groundedness. The contrast serves to remind us of the need for earth when we profess what we believe. The tense aspects between the Moon in Aries, Pluto in Capricorn, and Uranus in Aries give us another chance to find our center amidst strong impulses to fight or control others. Thursday, May 5. As the Moon moves into Taurus we begin to feel the gravity of earth’s intelligence pulling us to the center. The New Moon in Taurus is an opportunity to plant seeds influenced by this sense of grounded embodiment. We receive information today about our New Moon intentions from the paradoxical relationship between Venus in Taurus and Mars in Sagittarius. This quincunx could be about the relationship between action and desire. When these are aligned we can feel creative and empowered, when they aren’t we can feel like we are wasting our gifts. How can you bring your actions into coherence with what you love? May 6—New Moon Moon: Dreaming. Where I live in Minnesota, the Taurus season is so darn seductive it’s hard to think about anything other than beauty, pleasure, and the sensuous earth. It can feel like a distraction until I realize this is just what I am supposed to feel. This is medicine for a long winter. This is wisdom straight from the Earth. Taurus is the fixed earth sign. It is ruled by Venus. It is portrayed as the Bull of Heaven, capturing the fertility and strength of this season. Into this season we are invited to plant a seed allows these Taurus qualities to grow into our lives more fully. I am inspired this month by the Rilke poem, How Surely Gravity’s Law, to feel in my body the force of earth pulling me to the heart of the world. I find that I am more aligned with earth’s wisdom when I actually feel the gravity of beauty, and pleasure, and the sensuous earth in my body. The chart for the New Moon supports this intention to surrender to the earth’s intelligence with a grand earth trine aspect pattern. The Sun and Moon in Taurus (fixed earth) are trine to Pluto in Capricorn (cardinal earth) and Jupiter in Virgo (mutable earth). The caution with any kind of grand trine is to overlook the opportunity to use this energy to the fullest, so it is important in this lunar cycle to create practices or reminders to sense into the body’s experience and wisdom. To get in touch with Pluto’s power go deep into the places that feel blocked. Pluto is a healing and transformational planet if we are ready to look at difficult areas of our lives. When we are ready for Pluto, we are able to see, integrate, and release these powerful lessons. To get in touch with Jupiter’s power find the uplifting desire to discover meaning. Jupiter is the opportunity planet. We can best access this when we know what serves the story of our lives and what doesn’t. Be discerning! And to get in touch with the Sun and Moon in Taurus, return to the distracting but also necessary experiences of beauty, pleasure, and the sensuous Earth. When we are so busy thinking that what we are supposed to be doing must also be difficult, it can be a revolutionary act to make ease and pleasure our guiding lights. Saturday, May 7. A grand earth trine aspect pattern has been a major influence all week. Today, the Sun makes an exact trine to Pluto bringing this energy to its peak. All systems seem to be telling us to go. Yes, Mercury in Taurus is still retrograde and Mars in Sagittarius is still retrograde too, so things have an element of strange to them, but notice the support you feel for meeting your obstacles today. Pluto is a great ally to the fertile and strong energy of Taurus. Pluto’s realm, the underworld, is the source of wealth and life force that Taurus manifests in the world. You may be reminded of the intimate connection between death and rebirth today. This earth intelligence reminds me how to let go of the things that do not serve in order to give birth to the new. The Moon enters Gemini (mutable air) infusing the day with a desire to learn, connect, and communicate. Enjoy the pollination of ideas! Sunday, May 8. We’ve had a bit of a break from mutable sign influence lately, but that changes today. 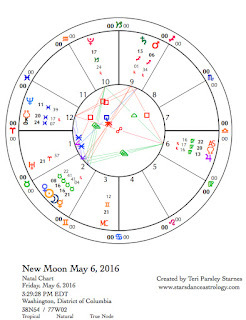 The Moon in mutable air completes a grand mutable cross aspect pattern. The Moon opposes Saturn in Sagittarius and is square to Neptune in Pisces opposing Jupiter in Virgo. Since Jupiter is stationing direct tomorrow, this energy may be the strongest. Do you feel like you can do anything? Do you also feel like you should do everything? By this I mean, clean that closet, plant the garden, start a diet, and put in a few volunteer hours on top of it all? Let Saturn’s conservative influence help you to prioritize and restrict all the ways you want to Virgo-out today. Balance is the key to a grand cross. Mutable emphasis makes it hard to focus on any one thing for long. Take breaks.